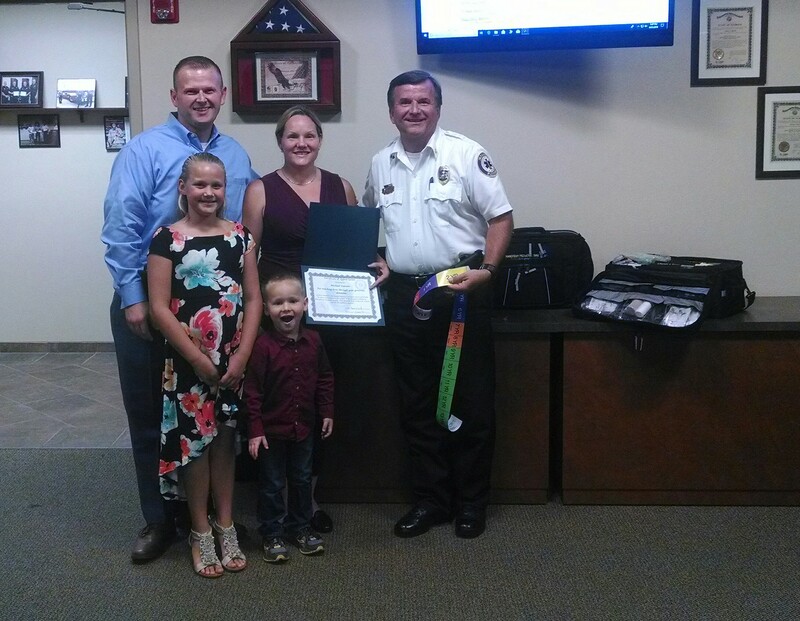 On June 21, 2018 the Southern Manatee Fire Rescue Fire Commissioners recognized Mr. Michael Damato for his generous donation of $5000.00 which was used to outfit all first out fire apparatus with the Handtevy Emergency Pediatric equipment. The Handtevy Emergency Pediatric System is the gold standard for pediatric emergency care. The Handtevy Emergency Pediatric System uses age first and length second in order to determine medication dosing and equipment sizing. Each kit contains a measuring tape that is used to measure from the top of the head to the sole of feet. Once the measurement is obtained it will reveal the age, approximate weight in kilograms and a color. Personnel will then open the Handtevy Emergency Pediatric System Bag and grab the corresponding bag that is identified by color and age. Inside of this bag will contain all the appropriate sizes of medical equipment for that sized pediatric patient. This system also contains all of the appropriate resuscitation equipment for infants and child up to adolescents, equipment such as ambu bags, infant to child blood pressure cuffs, pediatric stethoscope and all sizes of the airways from oral, nasal, I-gels and endotracheal tubes, however these airways are broken down further in the age/color bags for rapid identification and utilization. The Handtevy Pediatric System, our system, was built utilizing Manatee County Pediatric treatment Protocols and all of the District’s Paramedics have completed the training for the Advanced Life Support side of the Handtevy Pediatric System.